Meow Meow Meme! Thank you so much for thinking about us! Niko loves to hang out on his grass bed. 2. Who is your kitty crush? Probably none for Goro. He doesn't like cats. He was very unhappy when we adopted Niko. Both Goro and Niko loves the scent of cotton swab. Niko loves "The Devil Wears White Bib." magazine editor, ruthless Goronda Priestly. Goro loves "Gorona Jones and the Last Catfight." went missing while pursuing the Holy Quail. 6. What is your favorite feline wisdom? I don't know who started, but it's so much fun!! Goro loves to go out on a deck. On the other hand, Niko is terrified of being outside. He has to be inside the house. but still enjoys the smell of nature. When Niko was rescued, he was trapped in a ditch. The melting snow almost gave him hyperthermia. he had to live outside before he was rescued. a grass bed warmed by sunshine to take a nap. Now I'm here for him to warm his bed. Today I'm going to talk about a quality mealtime. tasty food makes your tummy happy. Use your paws when eating dry food. When you are offered a beverage, drink it. Bury your left-over food after you finish eating. In case you don't like your dish, just sit on it. You will get a fresh food - I guarantee it. If you are already using these table manners, great! you enhance the quality of your mealtime. 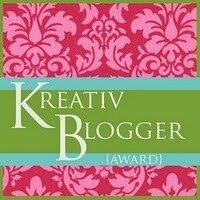 Corner of Cat's Mind for the Kreativ Blogger Award. I always enjoy visiting Catherine's blog. It is filled with sweet minds and beautiful photos! This award wants me to say 5 things about us. Goro is SMART and STRONG. Niko is SWEET and SENSITIVE. They are both very SPECIAL for me! the difficult part as I love all the blogs I know! Please play a riddle below while I'm thinking. and in the evening upon three? The answer must be a CAT. always feel warmer when visiting her. We wish you all have a wonderful week! !